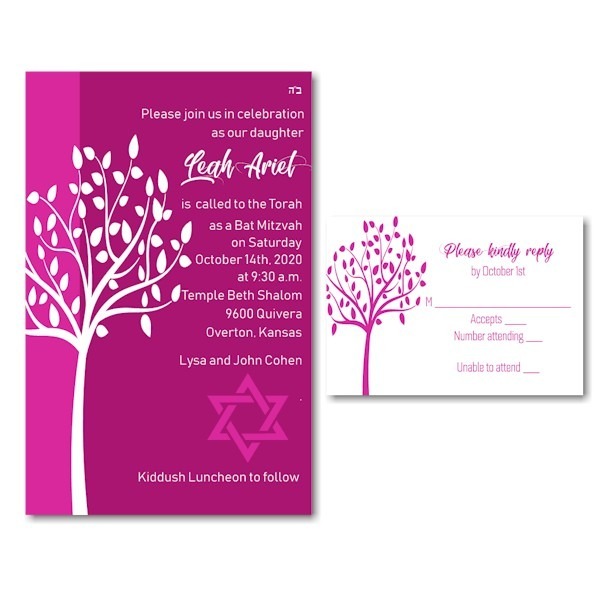 A contemporary, white tree of life is the focal point against two shades of pink on this trendy Bat Mitzvah invitation that is digitally printed on 110# gloss cover stock. 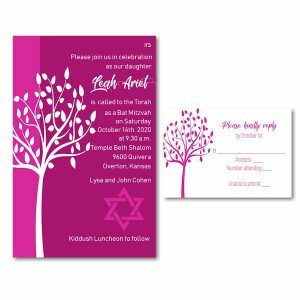 A contemporary, white tree of life is the focal point against two shades of pink on this trendy Bat Mitzvah invitation that is digitally printed on 110# gloss cover stock. Measures 5-1/2″ wide by 8-1/2″ high. Shown with White ink and lettering styles Quarca/Moving Skate. The coordinating Reception and Response enclosures will print on matching bright white glossy card stock and the Thank You notes will print on White Matte folder stock. 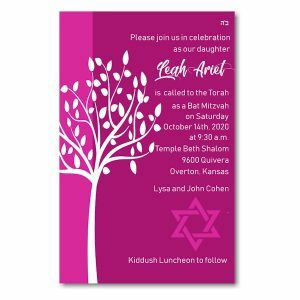 Single White Matte envelopes accompany this Bat Mitzvah Invitation.